I am catching up, this one was from May. Doubt you can find this one in stores anymore, too bad it was rather nice. Perhaps I should try and give a bit on knowledge, the limited amount that I have. 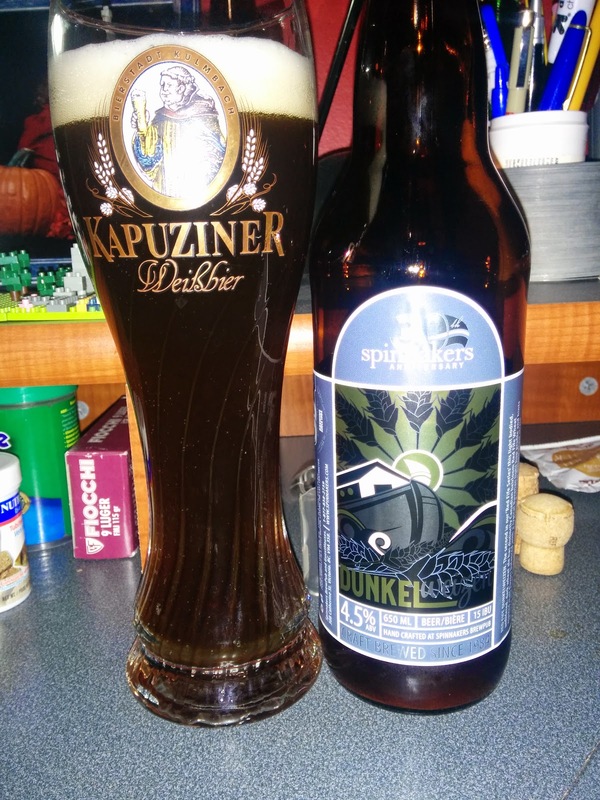 Dunkelwiezen is loosely translated into dark wheat ale. This dunkel is an ale, as contrasted with a Munich dunkel which is a lager. This style of wheat beer is middle of the road beer. Nothing too flashy, IBU bitterness not too high and ABV in the normal range. The unique flavours come from a combination of lots of wheat malt used, usually 50% or higher, and a wonderful German wheat yeast. This yeast produces all sorts of spicy phenols and fruity esters. Cloves and pepper flavours are from the phenols and the banana and bubblegum are fruity esters. For those that want to get super beer geeky, take a whiff of a wheat beer and say, "Mmmm, love that isoamyl acetate and 4-vinyl guaiacol. These and the chemical compounds associated with the flavours of bananas and cloves, respectively. Enough knowledge, what about the beer. Beers like this are rarely highly rated because they are just simple and nice. Nothing too flashy in the nose, just the expected toasted banana bread, cloves and mild vanilla. The sip is spot on with a creamy fruitiness with hints of chocolate, wheat cakes and saw dust. There was a bit of soy in there, but nothing outrageous. My finish was a banana bread creaminess the faded quickly away. Just a simple and tasty sipper. Glassware: Most certainly a German weizen glass. This glass is unique with a tall body and an exaggeratedly large bowl at the top. These beers tend to produce a large fluffy head due to larger than usual amounts of protein from the wheat malts. I love these glasses because they are often very ornate with great art and sometimes gold rims. Food Pairings: Most anything will do as the beer flavours are calm. Something grilled and slightly fatty would work nice, maybe with some breadiness too. I'm thinking of a spicy sausage sandwich.